There are several times during the calendar year when Jesus followers have a unique opportunity to connect the dots between God’s heart and the hearts of multitudes that we encounter on our daily rounds. The Christmas season is perhaps the greatest of those times! 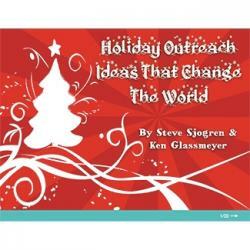 This PDF is filled with 14 great ideas that will help you show God's love in practical ways during the holiday season! This is one of the most powerful ways you serve a person during this time of the year. It is powerful because you are able to engage in a genuine conversation with them as you wrap their gift. More times than not, they will ask you why you are doing this for them. That curiosity will provide a natural opportunity for evangelism. With that said, it is easy to get caught up in the physical action of present wrapping. We need to take care not to forget the spiritual aspect of serving them. It is always best to slow things down a bit. Take ample advantage of the opportunity to share God’s love. There are several pointers to keep in mind if you are doing this as a larger scale event. You will need to begin recruiting a fairly large volunteer force—don’t procrastinate—start vision casting now! The key to this outreach will be the personnel you have gathered together. They must be enthused and on the same page. You are looking for the people that are excitement catalysts in your church. These folks thrive on the energy and joy of the season. Start gathering materials now! Don’t put this off. Don’t wear out your volunteers. Keep in mind this is a busy time of year for everyone. Stick to outreach shifts that last no longer than two hours. Over the years we have discovered that two hours is the threshold for quality experiences. We want our volunteers to be excited about this event and we want that excitement to flow out to the people they serve. At about two hours even the best outreach ceases to be fun and the perception of it being a rigorous and difficult chore kicks in. Order plenty of what you will need. Keep in mind you don’t want to frustrate your volunteer force. Have plenty of scissors for the cutting of paper. Have plenty of scotch tape dispensers to go around. The name of the game here is to have “More than plenty” so people will not have to twiddle their thumbs waiting on restocking when they could be serving the public and having divine conversations. Start praying now! We will be connecting with people who are not yet connected with us nor are they connected with the God of heaven and earth. They are in immense spiritual need, no matter what walk of life they come from. We are his representatives. We are not only wrapping presents - we are spiritual ambassadors. We need to blend the spiritual act of praying with the physical act of serving. If we get out of sync with our serving we cease to be effective in our activity. We are merely chasing our tails.